Without the right amount of attention, your plants will be unable to thrive in your yard. We are currently smack-dab in the dog days of summer. August is one of the hottest months of the year in the Mid-Atlantic region. Without the right amount of attention, your plants will be unable to thrive in your yard. 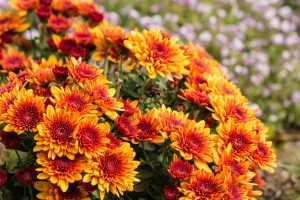 Many home and property owners are under the misconception that they can’t achieve a colorful landscape during this time of the year. By incorporating a few heat-tolerant plants to your garden, flower beds, and containers, you can refrain from your property appearing dormant. Here are a few examples of plants that can withstand the summer heat! Marigolds are easy to grow this time of year. Unlike many plants, marigolds bloom during the summer and early fall when it is exceptionally hot out. They are a popular option that comes in various shades of yellow and orange. When planting marigolds, be sure that they have full sun and are placed into the well-draining soil. Cosmos can withstand high heat with minimal waterings. A major benefit to this annual is that they thrive in poor soil. You don’t have to pay much attention to them at all. All you need to do is to enjoy the color and beauty they provide to your yard. They are similar in appearance to daisies and can be found in white magenta, orange, red and yellow. If you are looking for a plant species that will tolerate the intense summer heat, look no further than geraniums. They are commonly planted in hanging baskets. In order for geraniums to thrive, they require a fair amount of water. If they are planted in the ground, they should be watered at least once a week. If they are in pots or containers, they may require daily waterings since the soil dries up faster. Geraniums can be found in a range of colors, such as reds, pinks, whites, purples, and orange. Do you have deer regularly strolling through your landscape? It is disheartening when you realize that your beautiful plants and flowers that you have been caring for all summer have been nibbled on by deer. In addition to being deer-resistant, Salvia is a low-maintenance plant. They are easy to care for and grow. They thrive in full sun and only require minimal watering during this time of year. Salvias can be found in various shades of blues and purples. This entry was posted on Wednesday, August 15th, 2018 at 4:54 pm. Both comments and pings are currently closed.